Austrian pianist; born at Prague May 30, 1794; died at Leipsic March 10, 1870. After a short course with Zadrahka and Horzelsky, his talent in 1804 attracted the attention of Dionys Weber, director of the Prague Conservatorium, who educated him in the pianoforte works of Bach, Handel, Mozart, and Clementi. His progress was so rapid that in 1808 he played in public a concerto of his own composition. Shortly afterward, in consequence of the death of his father, Moscheles was thrown upon his own resources and went to Vienna, where he supported himself as a pianoforte teacher and player, and pursued his studies under Albrechtsberger (counterpoint) and Salieri (composition). He soon became one of the most popular teachers in Vienna and was on friendly terms with Meyerbeer, Hummel, and Beethoven, the pianoforte arrangement of whose opera "Fidelio" he assisted in preparing. Moscheles' career as a virtuoso may be said to have begun with the production of his "Variationen über den Alexandermarsch," op. 32, in 1815, a work which met with brilliant success. He became the founder of a distinct school of pianoforte-playing characterized by original methods of tone-production, and hence he has been justly called the greatest pianist from the time of Hummel to the advent of Chopin. In 1816 he began a series of tours which extended over a period of ten years. In 1822 he composed the duo "Hommage à Händel" for J. B. Cramer's concert in London. In the following year he returned to London, and in 1824 he gave piano lessons to Felix Mendelssohn, then a boy of fifteen. Shortly after his marriage to Charlotte Embden at Hamburg, in 1825, he settled in London, and he remained for ten years in England. In 1832 he was elected one of the directors of the London Philharmonic Society, the musical leader of which he became upon the resignation of Sir Henry Bishop in 1845. At the invitation of Mendelssohn, Moscheles in the following year accepted the first professorship in the pianoforte department of the newly established Conservatorium at Leipsic, with which institution he continued permanently identified until the close of his life. Among the numerous works of Moscheles are: "Concerto in G Minor," op. 60; "Concerto Pathétique," op. 93; three "Allegri di Bravura," op. 51; 24 "Etudes," op. 70; "Charakteristische Studien," op. 95. 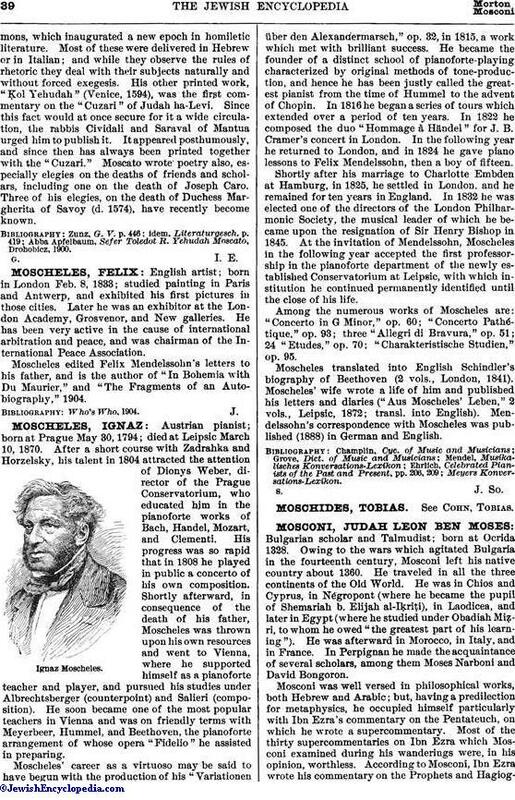 Moscheles translated into English Schindler's biography of Beethoven (2 vols., London, 1841). Moscheles' wife wrote a life of him and published his letters and diaries ("Aus Moscheles' Leben," 2, vols., Leipsic, 1872; transl. into English). Mendelssohn's correspondence with Moscheles was published (1888) in German and English.